OluTimehin Adegbeye: How Can Cities Make Space For Their Most Vulnerable Residents? OluTimehin Adegbeye on the TED stage. Part 2 of the TED Radio Hour episode Building Humane Cities. OluTimehin Adegbeye says that in the world's megacities, the most vulnerable get left behind — including in her city, Lagos. But it's these people, she says, that most deserve space in modern cities. OluTimehin Adegbeye is a writer, speaker, and activist. Her work focuses on adressing issues related to gender, sexuality, and poverty. Her writing and activism have made her a prominent figure in the Nigerian and African feminist communities. Currently, she works as a communications officer with JEI, a human rights organization based in Lagos. It's the TED Radio Hour from NPR. I'm Guy Raz. And on the show today, ideas about building more humane cities, cities that make space for everyone, especially the most vulnerable. OLUTIMEHIN ADEGBEYE: Yeah. I actually was, yes. And I've spent most of my life there. RAZ: So Lagos is your home. Lagos is your home since you became a human in the world. ADEGBEYE: Yes. Yes, this is accurate. RAZ: This is OluTimehin Adegbeye. She's a writer in Lagos, Nigeria. ADEGBEYE: But the kind of stuff I write is generally about rights-based issues, human rights. So I focus on the rights of the urban poor. RAZ: Can you describe what Lagos is like? Like, what would I see if I went there? ADEGBEYE: So I guess it depends on which Lagos you live in, right? And I think that may be because it's universal where the - where cities are concerned. Like, you can be in the same physical space, but because of your identity or your social location, you experience it completely differently. So for instance, the Lagos that I experience is different from the Lagos that my daughter's nanny experiences. So you're driving down, say, Third Mainland Bridge, and you look to your right or your left, as the case may be. And you can see some of the fishing settlements that have now been termed slums along the side of the bridge. You can see the landfilling that's being done on the other side where they're reclaiming the lagoon in order to build some sort of middle-class entertainment/parking garage thing. And if you're going from the mainland to the island, then the landscape of the city changes. The houses are bigger, clearly more expensive. The cars are nicer, right? There are traffic lights that work, you know? I think regardless of which Lagos you experience, you do see the starkness of the differences along those class lines. RAZ: And that inequality, it only deepened over the past 40 or 50 years in Lagos thanks in part to an explosion in population growth and a changing economy. ADEGBEYE: Class has become much more cemented. Class mobility is not as clear-cut or as possible as it used to be in my grandfather's generation. It was easy to send one or two children to school, have them access jobs, and then have them send their siblings or their cousins to school and slowly sort of lift the whole family out of poverty in one or two generations, right? And that's no longer possible. 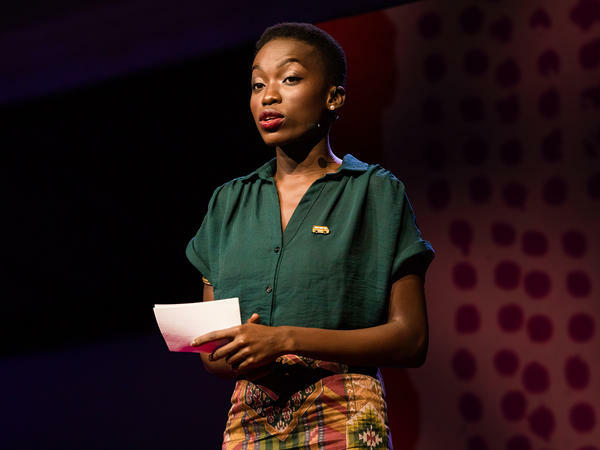 RAZ: OluTimehin Adegbeye picks up this idea from the TED stage. ADEGBEYE: There's so much that is possible in Lagos and so much that isn't. And very often, the difference between possibility and impossibility is simply who you are. Belonging in Lagos is a fluid concept determined by ethnic origin, sexual orientation, gender, but most visibly - and often most violently - class. Before Nigeria became a country, fisherpeople from the inland creeks started to come down the Lagos Lagoon and establish villages along the coast. About 60 years later, my grandfather, Oludotun Adekunle Kukoyi, also arrived in Lagos. Over time, he built an illustrious career as a land surveyor, mapping out now-bustling neighborhoods when they were just waist-high wild grass. He died when I was 9. And by that time, my family, like the families of those fisherpeople, knew Lagos as home. Among the Yoruba, we have a saying, eko gb'ole, o gb'ole, which can be translated to mean that Lagos will welcome anyone. But that saying is becoming less and less true. Many Lagosians, including the descendants of those fisherpeople who arrived generations before my grandfather, are now being pushed out to make room for an emergent city that has been described as the new Dubai. You see; Lagos inspires big dreams, even in its leaders. And successive governments have declared aspirations towards a megacity where poverty does not exist. Unfortunately, instead of focusing on the eradication of poverty, as you would expect, the strategy of choice focuses on eliminating the poor. Last October, the governor announced plans to demolish every single waterfront settlement in Lagos. There are more than 40 of these indigenous communities all over the city with over 300,000 people living in them. Otodo Gbame, a hundred-year-old fishing village with a population about three-quarters that of Monaco and similar potential for beachfront luxury, was one of the first to be targeted. RAZ: ...Hide those places from the gaze of the world. ADEGBEYE: Yes, to attract foreign investment. You know, you have to look like where the foreign investment is coming from, so you erase anything that doesn't look like that, even though nothing looks like what. I mean, by definition, the whole of Lagos is a slum, right? Let's be honest. If we take the technical definition of lack of sanitation services, lack of infrastructure, the whole city is a slum. But more and more you'll hear agencies or government officials talk about ultramodern projects. And what they really mean is stuff that's, like, steel and concrete and glass and mirrors and, you know, look like the New York skyline-type aesthetic. So you can use this sort of rhetoric to push out poor populations. Or at least this is what they hope will happen. But the truth is, like, in the end, poor people don't just disappear, right? So if you push them further and further away from wherever it is that you want to make into a shiny suburb or, you know, locale, where do you think they're going to go? OLUTIMEHIN ADEGBEYE: The conditions that cause us to define certain neighborhoods as slums can be effectively improved but not without recognizing the humanity and the agency of the people living in them. In Lagos, where public goods are really publicly available, slum dwellers are often at the forefront of innovating solutions. After being disconnected from the grid for months because the power company couldn't figure out how to collect bills, one settlement designed a system that collectivized remittances and got everyone cheaper rates into the bargain. Another settlement created a reform program that hires local bad boys as security. They know every trick and every hideout. So now troublemakers are more likely to get caught and reported to police. And fewer of the youth end up engaging in criminal activity. Slums are an imperfect housing solution, but they are also prime examples of the innovation, adaptability and resilience at the foundation and the heart of every functional city. We have our own identity, our own rhythm. And as anyone who knows Lagos can tell you, poor Lagosians are very often the source of the city's character. Without its poor, Lagos would not be known for its music or its endless energy or even the fact that you can buy an ice-cold drink or a puppy through your car window. RAZ: So you spent time in some of these neighborhoods that, I guess, are defined as slums. And - I mean, what did you experience? What were they like for you? ADEGBEYE: I mean, I remember the first time I went into one slum that's literally built on, like, an island of garbage. That's sort of - it's packed really tightly. And then it's layered with sawdust. And then there was sort of - some sort of carpeting or sand or something. But then if you go into the place and you see the people who live here - and they have all kinds of entrepreneurial initiatives. They're making marginal profits on a daily basis but enough to pay their rent, to send their kids to school, to scale up their businesses where that's possible and to save. And you realize from interacting with the people in particular that there's not that much that's so significantly different about them. And there are people who have the economic wherewithal to live elsewhere who just don't want to because there's a quality of life that comes from living in such close proximity to your friends and your family and your colleagues and your church members or your - the people you go to mosque with. There's a sense of community that is so rich, that is almost impossible to get in more formal neighborhoods in Lagos, right? ADEGBEYE: When those fisherpeople started to sail down the lagoon in search of new homes, it could not have occurred to them that the city that would rise up around them would one day insist that they do not belong in it. I like to believe that my grandfather, in mapping new frontiers for Lagos, was trying to open it up to make room for other people to be welcomed by the city in the same way that he was. On my way here, my grandma called me to remind me how proud she was, how proud he and my mother would've been. I am their dreams come true. But there is no reason why their dreams or mine, for that matter, are allowed to come true while those of others are turned to nightmares. And lest we forget, the minimum requirement for a dream is a safe place to lay your head. We must hold our governments and ourselves accountable for keeping our shared city safe for everyone in them because the only cities worth building - indeed, the only futures worth dreaming of are those that include all of us, no matter who we are or how we make homes for ourselves. Thank you. RAZ: OluTimehin Adegbeye. She's a writer in Lagos. You can see her full talk at ted.com.